Here’s a step by step guide on how to jailbreak 10.2 on supported devices using yalu102 jailbreak and Cydia Impactor. As mentioned in our initial release post for Luca’s yalu102 jailbreak, it is important to note that that this jailbreak is still very much beta due to which it will be buggy and not everything will work on it. Also, it is a semi-untethered jailbreak meaning you will have to boot your device into jailbreak mode after every reboot. And while it works on all non-iPhone 7 64-bit devices, support for iPhone 7 and 7 Plus will be added in future updates. Supported devices and firmwares include: iPhone 6s, iPhone 6s Plus, iPhone 6, iPhone 6 Plus, iPhone SE, iPhone 5s, iPod touch 6 and all 64-bit iPad models running iOS 10.0, 10.1.x, 10.2. 32-bit iOS devices are not supported at all. 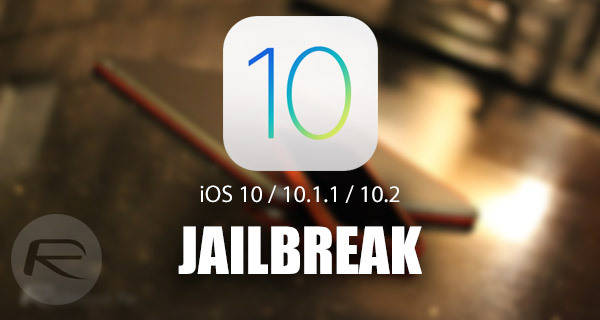 Download yalu102 jailbreak from here: Download Yalu102 iOS 10.2 Jailbreak IPA File For Compatible iPhone And iPad. Download Cydia Impactor from cydiaimpactor.com. A free or developer Apple ID is needed. You can register for a free Apple ID from appleid.apple.com. Make sure you have latest version of iTunes installed. A computer running either Windows or macOS. Step 1: First up, connect your compatible iPhone or iPad device to a Windows or Mac computer using a Lightning/USB cable. Step 2: As a precaution, make a complete backup of the data on the device using iTunes so that you can return to it in case anything goes wrong with the jailbreak process you are about to perform. Step 3: Launch Cydia Impactor on your computer. Step 4: Drag and drop the yalu102 IPA file you downloaded earlier on Cydia Impactor. 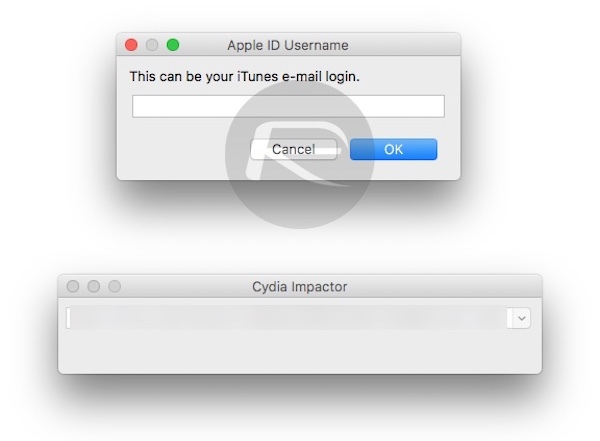 Step 5: Next, enter Apple ID credentials when Cydia Impactor asks for it. 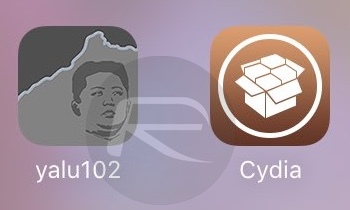 Step 6: Wait for Cydia Impactor to install the yalu102 jailbreak app onto your iPhone or iPad. 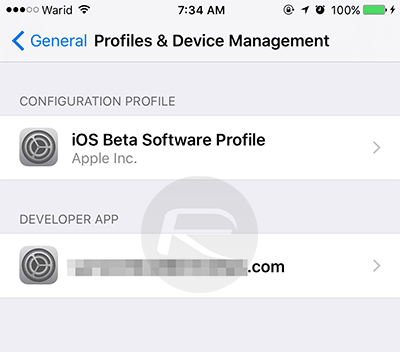 Step 7: Once installed, disconnect your device from computer and head to Settings > General > Profile(s) & Device Management or General > Device Management and hit Trust and then Trust again on the certificate you used to install this jailbreak app. Step 8: Now launch the “yalu102” jailbreak app from the Home screen. You may get a prompt saying this app may slow down your iPhone, tap on “OK” to continue. 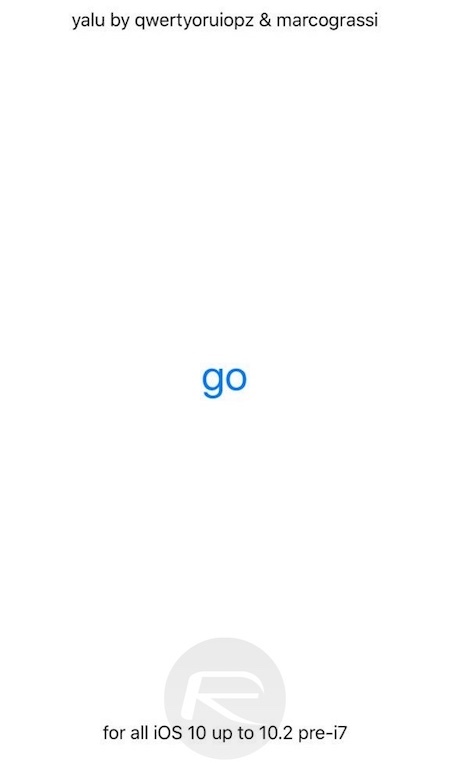 Next, tap on “go” in the yalu102 app and wait a few seconds so that it can do its thing. You will get “Storage Almost Full” prompt, followed by a respring of the device, after which Cydia will show up on the Home screen of the device. If Cydia doesn’t show up on the Home screen, run yalu102 app once more and try again. That’s it! 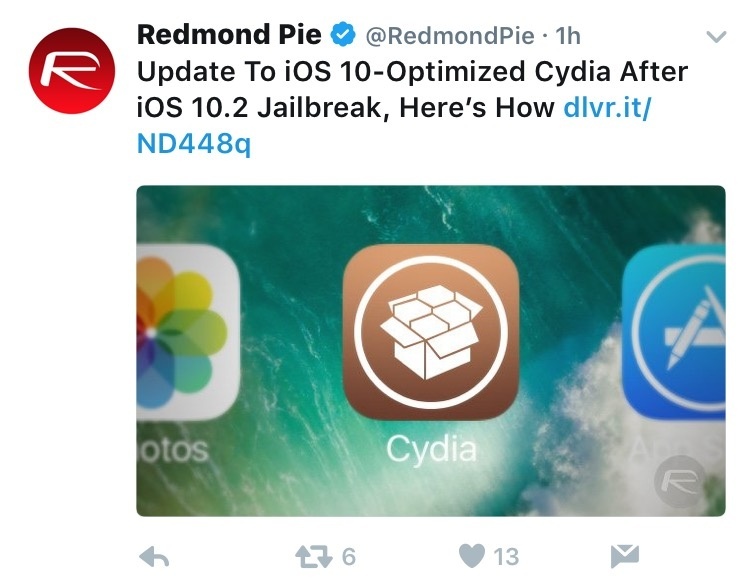 Your device should now be jailbroken with Cydia installed on iOS 10.2 as shown in the screenshot below. As mentioned earlier, since this is a semi-untethered jailbreak, it means you will have to put your device in jailbreak mode after every reboot. To do this, simply follow our guide here: Re-Jailbreak iOS 10.2 Yalu102 After Reboot, Here’s How. As is usually the case with jailbreaks of this nature, if a free regular Apple ID is used to install the jailbreak, it will expire after seven days, after which you will have to re-jailbreak it again from Step 3 onwards. Good thing though is that you won’t lose any of your data, settings or tweaks installed as part of the re-jailbreak process. If you use full developer ID for jailbreaking, you won’t need to re-jailbreak for up to a year. Questions or having issues? Drop it in the comments below. i done jailbreak on my iphone 6s two times… my all icons disppeared and also dont come into search. So I am assuming this does not work on the iphone 6 plus? I just tried it and all that happens is my phone reboots after hitting ‘go’ and no Cydia app shows up. Anyone else had any luck with their 6 plus?? Is there a solution for not jailbreaking every week? On iOS 9.3.3 there is jbme solution. No limitation for the certificate. This thing is buggy AF!!! Do not use it! It keeps crashing and twice so far on reboot you get nothing but the Apple logo. Have to blow it all out and start all over again after that. impactor doesn’t open at all after downloading several times, using mac! When I hit “My Account” on Cydia, I try to click on the Google link to sign into my Google account to load the already purchased tweaks, but nothing happens. Is this happening to you too? having the same problem. Can’t log in into my Google account so I can’t load any of my already purchased tweaks. same problem is it not compatible with iPhone 7???? Nope i just tried it and it logs in fine have you tried a hard reset and then re jailbreak? Hmm.. I’ll try again thank you! Works for me perfectly fine, but jailbreak tweaks such as phantom lite and incognito messages dont seem to show up after installing. Yes, it’s a little buggy but what do you expect? After repeated tries, I get the Cydia icon but like the others, nothing on the main page of Cydia does anything. Haven’t tried searching or installing. It is a BETA though, on iPhone 6S w/ 10.2 here. Same issue. 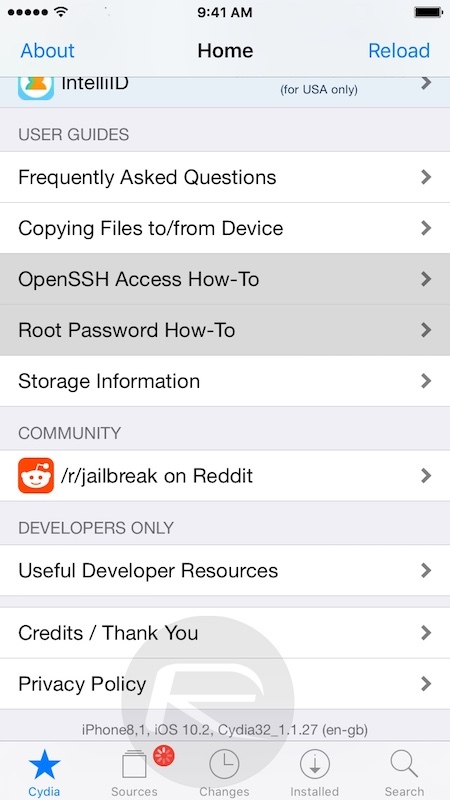 Stay away from this jailbreak for now. So I had to add another repo by Saurik which fixed the problem. Thank you anyways though! I’m having the same issue. What was the repo? I can’t get cydia to sign into to google. It will come up sporadically, but I haven’t been able to get to my purchased items. Any help would be appreciated. I tried to post the link but RedmondPie needs a mod to approve the post. Anyways, I attached a screenshot of the reddit thread. This should work wonders for you! Seems my post won’t be approved with a link of how to fix the Cydia/Google issue. So Google how to update Cydia to the 64 bit version. That’s why you can’t view purchased content. Is the jailbreak available for iPhone 6 Plus? Hello again 🙂 do you know why Activator keeps saying Disabled, needs bootstrap or cydia substrate? Did anyone get any issue jailbreaking at the Cydia Impactor step, possibly? It may have been the IPSW file I downloaded (but I used the link RP provided) to upgrade from 9.3.3 to 10.1.1 originally. When I went to turn my phone back on, it put me in an Activation Lock and someone else’s email address was given for the Apple ID. It took Apple over 2 hours troubleshooting and verifying that the phone in my hand was in fact mine. I used my Apple ID as the login during the Impactor step, so I don’t know what happened. I have a 6s+ and it works fine. Not sure what the other guy is talking about, but the article states it will work fine on a 6s+. I was dragging it the wrong way, haha. It’s working fine now. Thanks. It will work on a 6s plus NOT a regular 6 plus. That is why you were able to jailbreak.